Schreiber Brothers Ltd. has been successful in winning the "OIRCA Safety Achievement Award, Category 1 - 100,001 Average Annual Derived Hours Worked And Over" for the year 2007. 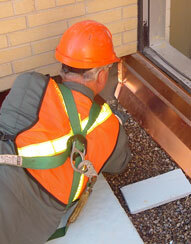 Total safety has become one of the foremost concerns for any industry and it is no different for Schreiber Roofing. At Schreiber Corporation, there has been an established position of safety director for the past 25 years. Every person occupying the position has been charged with the task of constantly improving the program. An incentive program is in place for foreman to receive cash bonuses, prizes and dinners as their crews demonstrate consistent compliance with company standards. Evidence of Success - Schreiber Corporation is 1 of 16 companies in a six-state region to earn the designation as a "Premier Safety Contractor" by the Roofing Industry Partnership Program for Safety and Health.